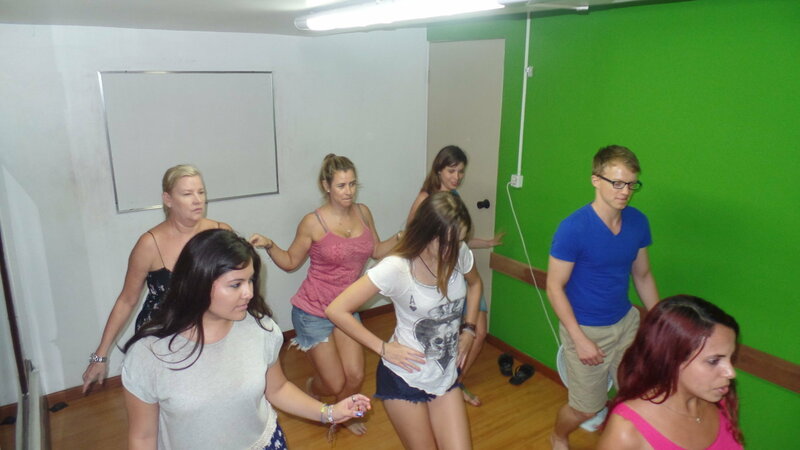 Last Tuesday at Rio & Learn our Portuguese students enjoyed an afternoon dancing Samba in Rio. Samba, a very traditional musical rhythm from Brazil, is usually loved by the foreigners, but most of the times they don’t know how to dance. With that in mind we promoted an amazing mix between Portuguese and Samba. Our students learned their first steps at the same time they practiced Portuguese. At the beginning it seemed a bit hard, but the students quickly showed they had some skills, and started dancing without major problems =). Our students were from Colombia, Venezuela, England, Germany, Belgium and Sweden…all from different countries, but united by the same goal: be ready to dance Samba in Lapa in the most carioca way possible. It was a very fun afternoon and our students will forever remember the day they spent dancing Samba in Rio. Come have fun and speak Portuguese at the same time you enjoy our RioLIVE! Activities!